Over the past few decades, superheroes, villains, and other characters taken from the pages of comic books have become as much a part of American mythology as Rip Van Winkle, Paul Bunyan, and Johnny Appleseed. Movie theaters are filled with fans that thrill to the exploits of Spider-Man, Batman, The Joker, Superman, and Iron Man. Across the country colleges are offering courses in the growing mythology of comic book lore as well as the medium’s importance and meaning in world culture. Today comic books enjoy a sheen of respectability that was missing from the first six decades or so of their existence. The story of how they got to this stage says as much about America as it does the industry. Without missing a step, Superheroes! Capes, Cowls, and the Creation of the Comic Book Culture by Laurence Maslon and Michael Kantor expertly tells the history of how illustrated stories about aliens, psychotics, and obsessively driven demigods have emerged triumphant over their numerous adversaries. This isn’t just a one note story where capes, flying men, alien policemen with wings, mutants, and women who can deflect bullets with their bracelets grab all the attention. As the companion to the PBS series of the same name, the book matches the same high research standards and excellence of such previous series as Ken Burns’ The Civil War or regular programs such as Frontline and Nature. We also read about the economically driven origin of the format, how the concept of adventure literature developed over time, what the books mean to our culture, and how they quickly evolved from being escapist literature to an art form that often reflects the world around them. The earliest days of comic books were akin to the days of the old west. Whoever got there made the rules. Books featured staples of the pulps such as detectives and adventurers, but funny animals, westerns and other genres were part of the scene as well. The appearance of Superman changed everything. The money made on the first issue of Action served as a fire alarm for other publishers and distributors. Suddenly they needed product, and it needed to feature a superhero—preferably a character like Superman only just different enough to keep lawsuits from being served. Almost instantly there were new heroes and comic books being created. Some lasted an issue, others lasted for hundreds. As the decades shifted so did the status of the superhero in America. The end of WWII saw a decline in the public appetite for superheroes. As the genre faded, westerns, romance, and especially horror began to fill the gaps. Comic books themselves came under attack from different areas, including the U.S. Senate. The late fifties saw the genre revived by the success of a new version of The Flash and others. It also began the industry’s talent for reinventing itself as often as it needed to. But it was in the early sixties that something brand new began to take shape. Stan Lee and Jack Kirby, two veterans of the Golden Age, came up with a team book designed to match the success of The Justice League of America over at DC. The Fantastic Four was something new. The heroes weren’t really sure that they wanted to be heroes—they fought, they argued, they often didn’t like each other. With the appearance of Spider-Man the modern age of superheroes began. Filled with self-doubt and conflicted guilt, he behaved like a real teenager. Reality had entered the picture and as the years passed, reality became very important to comic books. The seventies saw drugs and social issues come into the picture. In the eighties critical success for The Watchmen and Dark Knight brought a media spotlight into the field. New routes of distribution suddenly enabled fans regular access to titles. As positive as the book is, the authors also cover the failures of the industry as well. They openly address the decades-long failure of the superhero industry to acknowledge women, gays, and minorities as part of the worlds they created. 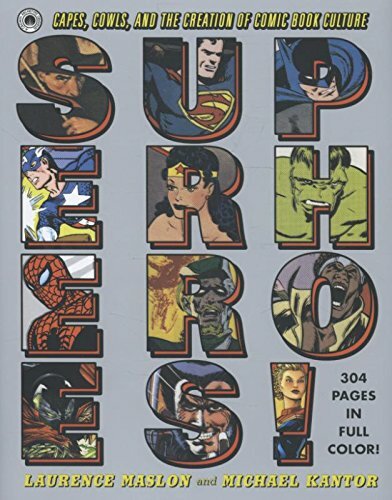 The book is profusely illustrated with memorable art and covers from the entire world of superheroes. The covers and art they duplicate are complete; there are no frayed edges or faded colors. Removing the defects may strike some purists as unauthentic, but it serves a greater purpose as many will be seeing these classic books and drawings for the first time. It also exposes the tremendous artistic skill of many of the creators. Adding to the historical perspective are interviews and quotes from those who wrote, drew, and often created the books. Using quotes from those who work inside the industry as opposed to observations made by academics brings a full sense of life and experience to the history. Observations and stories by Stan Lee, Joe Simon, Carmine Infantino, Jules Feiffer, Jerry Robinson, Neal Adams, Denny O’Neil, Marv Wolfman, and many others remind us of the very real people who have built and created much of the world that thrills us today. This is a deeply knowledgeable, engaging, and respectful history that doesn’t shy away from inequities and failures. The book will enlighten the casual fan and challenge lifelong fans. Plus the inside covers to this book holds ads for hold X-Ray Specs, a trick baseball, a Raquel Welch pillow, and of course, SEA MONKEYS!